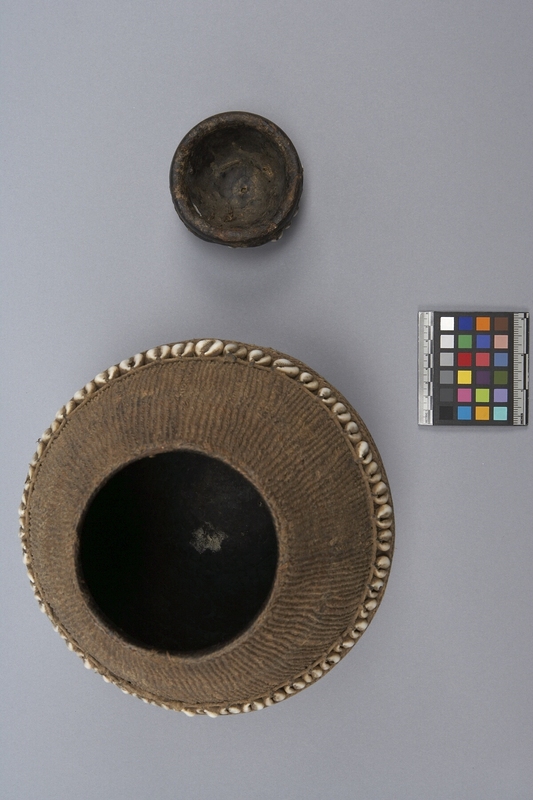 Item number Ca69 a-b from the MOA: University of British Columbia. Large tightly coiled container (part a 28 x 20.7) that has a bulbous shape narrowing at the top and the bottom. Base is rounded, and mouth rim is tightly wrapped. Container is coiled in sixteen sections vertically placed. 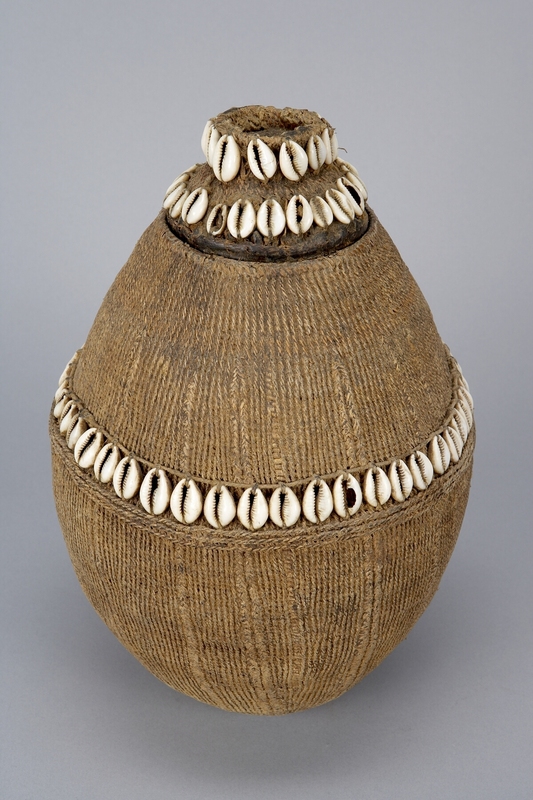 Cowrie shells are knotted on around the centre and vertically placed. 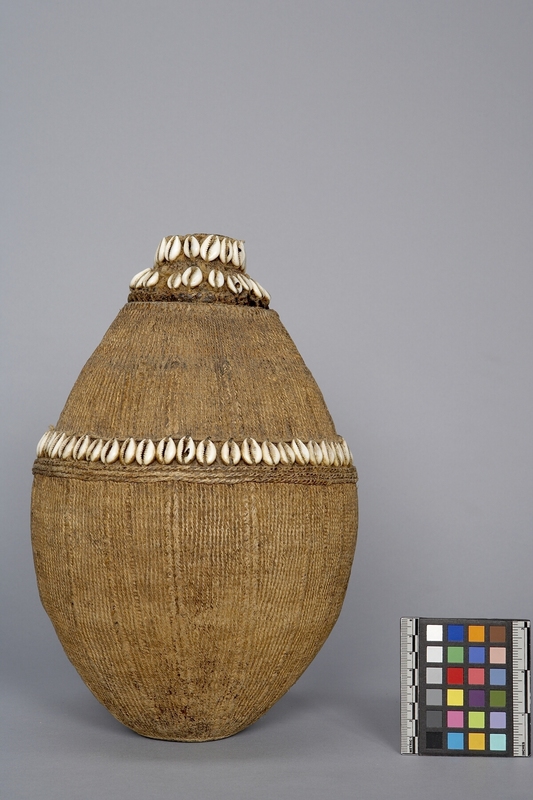 Lid (part b) has two rows of cowrie shells, vertically placed. Top of the lid caves in. Lid fits on well. Probably a 'gorfa' type container which would normally be encased in a 'seephani' holder consisting of leather straps. The straps would be used to secure the lid and to suspend the container. Normally used to hold fresh or curdled milk. Cowrie shells are a sign of wealth and a symbol of fertility to many people of Kenya. The inside of most vessels are charred black because the sterilizing process involves burning embers of special tree, usually resulting in smoky tasting contents. The charred inside also acts as a seal to make it water tight. Borana men and women make containers, men make wooden ones and married women make woven ones. Called 'xoda' if it has a recessed lid, 'chicho' if convex. grass, giraffe hair, cowrie shell and resin ? grass hair, giraffe shell, cowrie resin ?